Having the support of another woman during pregnancy is important. Women have been helping and caring for each other during childbirth since the beginning of time. Having encouragement from another woman has been proven to have a positive impact. This Is What I Doula Penrith will help you have a more pleasurable and less stressful birth. A doula has been trained in childbirth and is able to provide emotional, physical and educational support during and after your pregnancy. At This is What I Doula in Penrith, Jaime will be your birth doula advocate and help you prepare to bring a new beautiful life into the world. She understands that family is the most important thing there is, and she wants you to know that your birthing process is important. Jaime will work with you by building a personal relationship and bringing a positive experience during your pregnancy. From the very first day, she will be with you and will help you with any questions or concerns that you may have. Jaime will be there for you whenever you need her. She is dedicated to you and your growing family. If you have any questions she will be there to provide you with answers as well as emotional and physical support. At This Is What I Doula in Penrith, Jaime will provide you with support throughout your whole pregnancy and after birth. She doesn’t only provide support for you, but for your partner as well. She will routinely check in to see how you are doing and see if there is anything that you need. If you have previously had a cesarean section, she can advise you on a VBAC birth. Just because you previously had a C-section doesn’t mean that you cannot have a vaginal delivery. Many women that have given birth both vaginal and by cesarean decide to deliver vaginally. 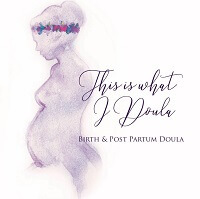 In addition to a birthing package, This is What I Doula offers postpartum doula services. Jaime will provide you with information on basic newborn care, infant soothing and mother-baby bonding. She will also help you with the emotional and physical recovery from the birth. It is important that you take care of yourself postpartum as well as your baby. Having a doula to help you through your pregnancy will also take pressure off your family and especially your partner. She is available whenever you need her. Jaime will be your advocate and will always be encouraging and helpful throughout your pregnancy. She only wants the best for you, your family and your new baby. As a birth and postpartum doula in Penrith, Jaime has had the pleasure of serving many women through different types of pregnancies. Giving birth isn’t easy and having someone that is trained and is knowledgeable in all aspects of pregnancy, birth and postpartum can be very calming and encouraging. Sometimes you need to talk to someone other than your partner and you have questions that they cannot even begin to answer. That’s what Jaime at This Is What I Doula in Penrith will be there for you for. © 2018 OUR PENRITH // PRODUCED BY WILD FOX CREATIVE // ALL RIGHTS RESERVED.